Hemp is a distinct variety of Cannabis sativa that has been used by humans for at least 10,000 years. It’s primary products are its fiber and food from oil-bearing seeds. Different parts of the plant have different uses, and different varieties are cultivated in different ways and harvested at different times, depending on the purpose for which it is grown. Hemp is not a drug (see medicinal marijuana). 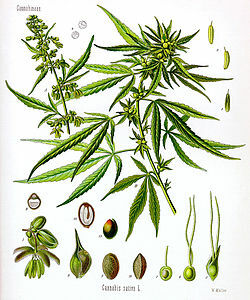 Since prohibition (beginning in the 1930s) hemp has been bred to be very low in THC (as low as .3%) – an effort to disqualify it as a drug and improve its industrial viability. Hemp has a poor CBD to THC ratio (about 20:1) – which makes it useless as a drug. Despite this, it is still prohibited by the U.S. Federal government under the excuse that it is part of the cannabis family. In most other nations, hemp is legally farmed and its products are exported to the U.S. (i.e. from Canada). Although several States have passed legislation to allow the farming of hemp, the Drug Enforcement Administration consistently destroys hemp crops and arrest the farmers, despite State laws and permits. Hemp is one of the most useful industrial crops people have ever used. Hemp can be used for producing hundreds of thousands of products. The fact of the matter is – it is so useful that it out-competes many other industries – and this is suspected to be the true reason for its prohibition. Hemp does not require herbicides or pesticides. Hemp can be grown in a wide range of latitudes and altitudes. Hemp converts CO2 to oxygen better than trees. Hemp nut is a very healthy food, being the highest protein crop (after soybean) and high in omega oils.